4Ground Terrian- Damaged Mordanburg Highstreet House #2This is damaged highstreet building number two, as you can see like damaged highstreet building one this building has taken damage from arson, war or dragon spillage.Many areas ravaged by fire are not rebuilt for months, sometimes years, becoming almost ghost towns the haunts of gangs and creatures most foul. Sometimes one can come upon a building that looks in perfect order only to find this a facade on turning the corner and observing that it is all but a shell. 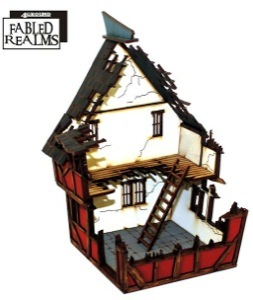 In Mordangurg a fire can be started easily, with this many timber framed houses the City Fire Guard never have a dull day, you could say their future is bright!28mm Scale models supplied unassembled.Miniatures not included and for scale purposes only.